We have some yellow jackets in our yard that are tenacious. Tenacious is a big word. It means holding fast, persistent, stubborn, or obstinate. Completing a task no matter what is being tenacious. Let me explain this to you. We have a mailbox in our front yard near the street. The mail deliverer can pull up with her jeep, open the box, and pick up or drop in our mail. Lickety split she is off to the next house. There is a big problem though. 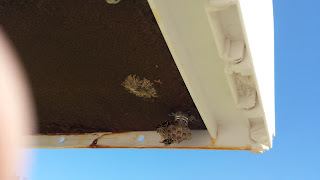 Some yellow jackets decided that a screw on the bottom of our mailbox made a great foundation to build their hive. This is not good for us or the mail carrier. We could get stung! My husband and I don’t know who could be passing and get stung by these guys. People could get hurt or worse, they could be allergic to the sting. Before the hive could get very big, my husband knocked it off, and ran. Ants ate the fallen hive. The next day, yellow jackets started another one in the same place. Again, he knocked it off. I was worried he would get stung but he didn’t. The next day they were back. He knocked the hive off again. They started another one that night. They are not only stubborn but tenacious. I didn’t want to hurt them, I wanted them to move on to another spot. I was stung by a bee when I was little and I didn’t want a repeat of that experience. Neither did I want anyone else to get stung. I also didn’t want our mail stopped being delivered because it was hazardous. At the same time, we were being invaded by ants. Tiny black grease ants were making a path from under the tile at our front door through the entry, across the baseboard, and into the kitchen. My grandchildren had stayed over for a week of fun and playing. We didn’t take as good of care of cleaning up after meals as we should have and some particles of food remained on the floor. This was an ant magnet. There were ant hills under weeds in the grass around the sidewalk. Everywhere I looked, I saw ants. Besides the ants, all over our front and back porches were spider webs. 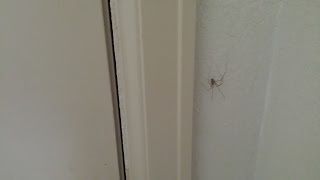 This house had been vacant when we moved in a while ago. I think the critters were given full reign. Now things have changed. I don’t like spiders nor ants. We sprayed them with the water hose to remove their webs but they came back. I disrupted the ant’s nests but this didn’t dissuade them. I didn’t want a repeat of the tenacity of the yellow jackets. These pests were given full warning. We got some spray at the local store and sprayed all over the front and inside of our house. Finally, we were free of the critters. 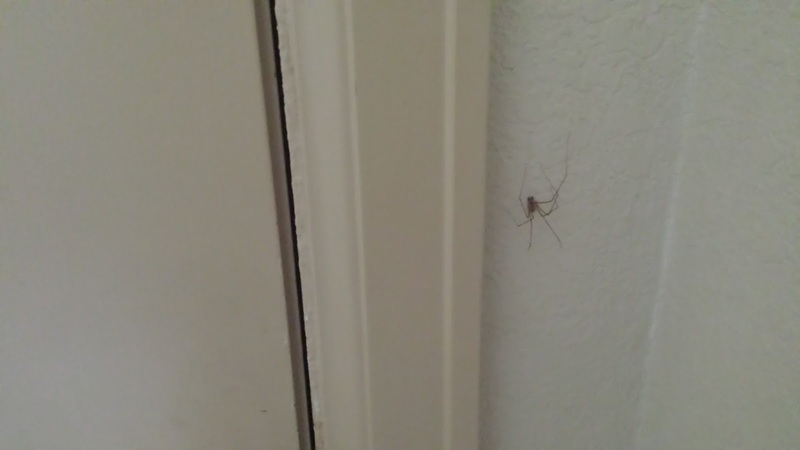 Although I have allowed a granddaddy long legs to live by my front door. They take care of other bugs and insects and don’t bite humans. Tenacity or being tenacious can be good or bad. It is good when you have a job to do and you stick to it like glue until it is completed. That is a good side of tenacity. But if you act tenacious when you shouldn’t it can be bad. Take for instance: If you have a bad habit and you won’t break it. Or you have been told not to hang out with a certain friend and you keep doing it in spite of the warning. Being stubborn is not always a good thing. Please memorize: Proverbs 29:1 He who is often rebuked, and hardens his neck, will suddenly be destroyed, that without remedy.